Many of you have heard of sand blasting and have a good idea what the technique involves, but just as many have never heard of using water to sandblast. Sandblasters are wonderful tools that clean and smooth a surface much faster than you could ever do by hand. They are able to get into corners and crevices that you normally can't reach with fingers or other sanding tools. Let's discuss sand blasting in general and then narrow this down to wet sandblasting. 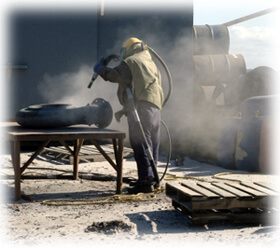 In the broadest sense possible, sandblasting is the process of using a machine to assist in sanding and cleaning a surface. The sand blaster is a powerful unit using water or air propelled at high speed to push solid particles across the surface you want cleaned and sanded. Now let's focus on wet sand blasting units, which are powered by a pressure washer. These generally come in three types, the first being a light duty sandblaster designed for small jobs and equipped with a ten foot line. Other types include a medium and heavy duty sandblasters that are designed for bigger, industrial sized jobs. These larger units are generally equipped with a 20.5 ft hose and can handle the bigger jobs you want to tackle. The way wet sandblasting works is simple: a probe (line) is used to draw in the sand (or any of the other materials discussed below being used as the abrasive substance) to the power washer extension wand where water will then be used to propel it toward the surface at high speeds. The combination of water and sand or other material easily blasts away the rough spots (rust, dirt) on the item you want cleaned or smoothed. Different materials are used for wet water sandblasting and each one provides a distinctive finish on the surface being cleaned. Below are three types of wet sand blasting media used in these machines. Using a wet sandblasting unit is simple and most mid to upper level primates can handle the task. Take the metal probe and insert into the sand or other product being used as the abrasive. Make sure the air intake hole on the probe is not buried in the sand — the hole helps create the vacuum that enables the sand to be pulled through the line. Next, place the blast head onto the end of the wand and you are ready to sandblast away. Any time you work with this type of power equipment, you want to follow pressure washer safety tips to avoid injuring yourself and others. Wet sandblasting is no different - use protective clothing such as heavy work gloves along with a face shield and long sleeves to protect your body when sandblasting. It is best to do this type of work outdoors but if you need to work inside, make sure the work area is well ventilated. As with most power equipment, particularly pressure washers, never point the nozzle toward anyone. Always point the nozzle downward when in use and make sure the sand supply line is above the water line - this ensures water will not enter the sand supply. Make sure the sand hose is always dry before use and the most critical step to take is to keep the sand covered at all times to prevent over spray/water droplets from contacting it. When you first begin wet sandblasting you should hold the wand several feet away from the item being sanded. If you get too close this could cause the object to be damaged. When the correct results are achieved maintain that distance. Soon you will be able to enjoy your perfectly smooth surface. The publisher of these pages is in no way responsible for any damage caused to you, your pressure washer or any power equipment, anyone else, your property, or anyone else's property by trying to implement or by successfully implementing the above-mentioned performance and services. What is "Cob Blasting"? Read this article to find out how the pressure washer industry is venturing into "greener" pastures.Sample related description. Find great suggestions from the experts on how to deal with this growing blight.